DiSC® is the leading personal assessment tool used by over 1 million people every year to improve work productivity, teamwork and communication. 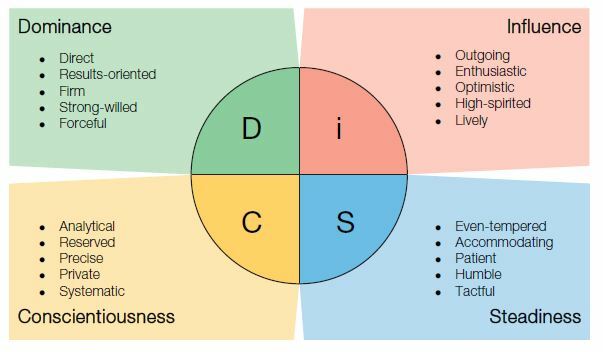 The DiSC® model provides a common language that people can use to better understand themselves and adapt their behaviors with others - within a work team, a sales relationship, a leadership position, or other relationships. Bringing in an expert facilitator is the easiest route for you to take. Aspen Edge Consulting is an Authorized Partner and Certified Facilitator of Everything DiSC®. Hiring us is quick, easy and cost efficient. This is best for smaller organizations who don’t have their own internal Learning and Development professionals on staff. There are several programs for you to choose to use. These kits provide everything you need to confidently lead a training session on your own. Each kit is designed to be flexible and comprehensive. They feature multiple, fully-scripted facilitation with engaging activities and workplace-focused videos. Trainers can switch out video clips, modify the PowerPoint slides, and add or delete sections to fit any timeframe. Certification is recommended but not required. Are you wanting to go deep with DiSC®? Then certification might be the best route. Everything DiSC Workplace Certification is your best resource to gain foundational knowledge and tools for facilitating Everything DiSC. Designed with your busy schedule in mind, this online course gives you the flexibility of self-paced learning, paired with live-collaborative sessions led by Wiley’s expert trainers. Increase your confidence and competence in delivering Everything DiSC Workplace in your organization. This course offers rigorous new content on the principles of the DiSC® model and the supporting research. During the live sessions, you will practice facilitating small groups and explore challenging scenarios that could arise during workshops. Four modules of self-directed and live collaborative learning (each requiring three to five hours of time per week), conducted over a four week period. Active knowledge checks to help participants assess how well they understand the content and to improve learning and retention. Final Certification exam (self-directed/graded activity). This intensive in-person course provides group learning and collaborative activities to guide you in exploring all the Everything DiSC Profiles including Workplace, Management, Sales, Work of Leaders, and the Everything DiSC 363 for Leaders.